Distributed as an eBook by NSCC for Shelley club members only. distributed without the permission of the author. The Chintz Project was an effort to identify all the patterns produced by Shelley and Wileman over the almost 100 years they were utilized. 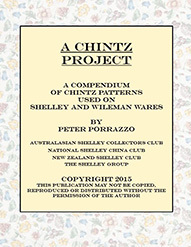 The result is an ebook over 100 pages long that provides the background for the project, a working definition of chintz, a list of all the patterns and a page (sometimes more) for each pattern.